Berlin developers Zerodebug are announcing a beta today for their new app, touchAble Pro. And so we get a first look at what they’ve been up to. The software sports a new, cleaner UI, but also comes a lot closer to being Ableton Live with complete touch support – or at least as close as you can get with the APIs Ableton make available. You can edit patterns with an overhauled piano roll view, and audio clips using a waveform display. There are new layouts, letting you view modules side by side or fullscreen. You can draw in or edit automation inside clips. It’s really starting to look like the touch app Ableton forgot, complete with full device support (including those pretty new Live 10 graphics), and even little details like being able to access I/O setting on channels right inside the app. Plus, you can customize exactly the layout you need, which means touchAble shines for live performance. Years ago, I caught the early live show by Glitch Mob, all on original JazzMutant Lemur hardware (that is, before the iPad was released). They were able to make giant buttons so they could trigger stuff in Live without distracting from a live drum routine. You can do that with this if you want – or any number of other layouts. Need specific clip triggers, huge? Want a particular mixer or clip launch layout? Draw it right on the device. Nice Live 10 support, but Live 9 is also compatible. 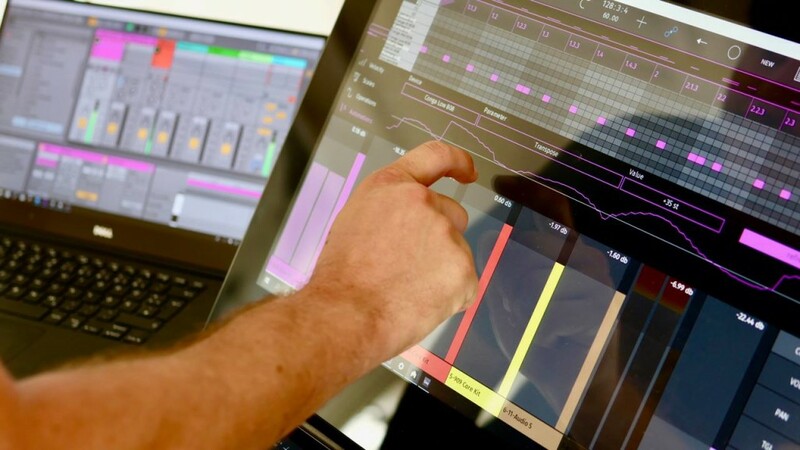 That’s actually touchAble Pro running on Windows – giant touchscreen, go!